Sweet potato casserole is good anytime of the year, don’t just have it for Thanksgiving. This casserole combines a sweet creamy inside with coconut. 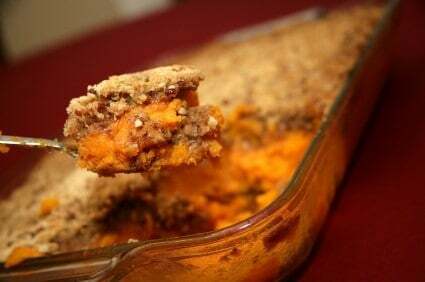 Sweet potatoes are covered with a lovely pecan sweet crust. This recipe is by Virginia McDowell. Jefferson City, Mo. 1984. This Sweet Potato Casserole is a family favorite. Beat casserole ingredients in mixer until well blended. Put unto a 2-qt. long casserole dish that has been well greased with butter. Mix and spread topping ingredients over the sweet potato mixture. Bake in 350 degrees oven for 55 minutes. I fixed this for my family and they enjoyed it so much they ate it for dessert as well. Thanks for sharing we love the broccoli casserole as well.